One of the goals of The Burnout Book is to introduce you to nurses who have experienced burnout in their career and have found ways to manage it. It's an attempt to let you know that YOU ARE NOT ALONE and to SPARK SOME IDEAS for ways you can approach your nursing career. I'm betting you'll find that you can relate to these people. Maybe you'll notice similarities in from their story to yours. If you're thinking to yourself, "I might be getting burned out," check out this blog post. In the meantime, let me introduce you to Sarah! 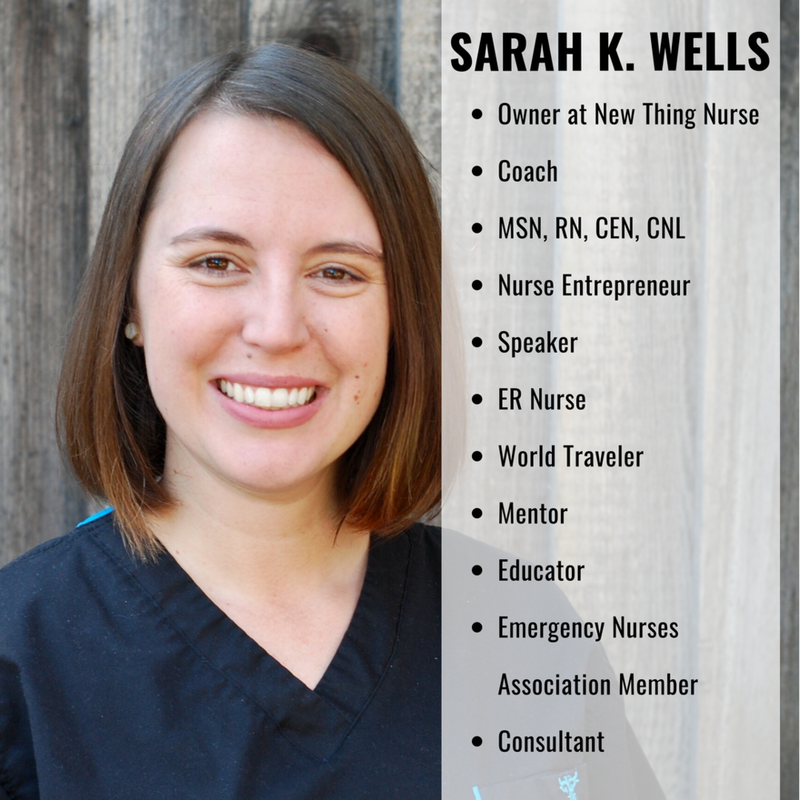 I want you to meet a resilient nurse, Sarah K. Wells, MSN, RN, CEN, CNL and owner at New Thing Nurse! Sarah and I met through Instagram, of all places. We connected through the fact that we're both passionate about supporting the nursing community and I've had the chance to take advantage of her resume overhaul service, as well as a one-on-one coaching session! I love following @NewThingNurse on Instagram because it gives me a daily dose of humor, tips for interviews and resumes, and some positive reinforcement to reach toward my goals. Sarah's excitement for what she does is contagious (in a good way) and makes you really excited about working toward your goals. She has an amazing positive energy and is a wonderful person! Just read the interview below and you'll understand what I mean. 1. Please tell me about yourself and your nursing career up to this point. It’s so nice to meet all of your Burnout Book followers! My name is Sarah! I am originally from southern Georgia, growing up in a small, university town near Savannah. I ran up north to Athens, Georgia to attend the University of Georgia (GO DAWGS!) and ultimately, the Medical College of Georgia (now Augusta University) to receive my MSN - Clinical Nurse Leader degree. I jumped right into nursing as a new grad in the emergency department. I worked in an amazing community hospital in Athens, GA. While we did not have a new grad program, I was precepted and taught by some incredible ER nurses who nurtured my interests, grew my skills and never made me feel like I could not do it. It was a pretty phenomenal experience. I feel very lucky. I then made a huge jump and started travel nursing, making my way to San Francisco, California. I worked in the area’s only burn center and got a true training in urban emergency medicine for a few years. Now I work in the East Bay at another incredible community hospital where I work at the bedside and get to help coordinate their pediatric care programs. Then last year, I started my business New Thing Nurse - a professional and academic coaching company for the nursing community. Today I have the amazing situation where I get to work clinically at the emergency department and also help nurses from across the country in their academic and professional pursuits through New Thing Nurse! 2. You are the founder of New Nurse Thing, a company devoted to helping nurses achieve their academic, professional, and personal goals. Tell me more about the business and how you come up with this brilliant idea! After years of working in hospitals across the United States, I saw so many nurses feeling unsupported in their work and not being able to pursue or achieve their dreams from a lack of resources and guidance. So many were unfulfilled in their work and often, talked about leaving the bedside. These were incredibly skilled and experienced nurses!! It did not make sense to me. I created New Thing Nurse with the vision of offering a supportive and collaborative community for nurses to help them pursue all of their new things. New jobs, new schools, new projects, new businesses - I am here to help with it all! New Thing Nurse has evolved to not only be a company that offers services to help nurses and nursing students achieve their goals, but also has become a real tribe of people who are here to learn, share and grow. Through the blog, the social media, workshops, speaking events, one-on-one clients and collaborations with other nurse leaders and influencers, New Thing Nurse has become a community that fosters support and guidance for nurses and nursing students across the United States and throughout the world. It has been an amazing journey, and I cannot wait to see how it continues to grow. 3. Merriam-Webster Dictionary describes burnout as "exhaustion of physical or emotional strength or motivation usually a result of prolonged stress or frustration." Have you ever felt burned out as a nurse? How did it develop? How do you avoid getting burned out again? I have definitely had my experiences with nurse burnout and try to be very open with my experiences to help other nurses know that they are not alone. My mental health suffered. I was physically not well. Burnout is real and can cause so many issues in your life and so often, we do not even realize that it is the root of so many other problems. Several years ago, I was having a very hard time in my professional and personal life. I was working night shift at a busy, suburban trauma center. I was having extreme insomnia, anxiety and depression. Work made me anxious. Not sleeping made me anxious. I was frequently tearful and sad. I was suffering from chronic pain, constant irritability and very low emotional periods. I knew that I had to make changes, or I would not be able to continue. I first started seeing a therapist. This was not easy for me to admit that I needed, but it has truly changed my life. I am a HUGE advocate for talk therapy. It is not for everyone, but it has helped me immensely. With my therapist’s help, I realized that I needed to get off of night shift and ultimately, to start medication treatment for my depression and anxiety. I also started exercising, working on my diet and actively trying to take time for self-care. It has been several years now, and I am in a completely different place. However it is a constant journey. Personal stress sometimes increases, making it harder to not feel increased stress from work. I always try to be aware of how I am emotionally and physically feeling now and seek out help when I need it. Nurse wellness is something that healthcare is just now really addressing. The more we talk about our challenges, the healthier and happier our nursing community will be. 4. Do you work with any nurses who are feeling burned out from their current situation, and if so, are there any observations you've made when working with them? The emergency department is a constant source for nurse burnout. Many of my New Thing Nurse clients also come to me with issues relating to nurse burnout, stress and compassion fatigue. What I have most often seen when working with nurses that are suffering with burnout is increased irritability, major apathy for their work and a real “checked-out” approach to nursing. Often these are coping mechanisms to help them get through their shifts, but it becomes a risk for patient and staff safety, not to mention a major contributing factor to poor nurse retention. We have to address these issues, or we are going to be in a position with a chronic nursing shortage in addition to a nursing workforce that does not want to be nursing. THIS IS NOT ACCEPTABLE. 5. Imagine you've just had a really rough week at work. What do you do on your days off to recover and get ready to bounce back for the next shift/work day? Decompression for me is key to getting over a hard day at work. Exercising, hanging out with people, talking things out or going to see my therapist have all been stress management strategies that have worked for me over the years. However sometimes, a shift is too hard to get over in a day. I have had cases that have taken me weeks to work through. These happen and are completely normal. Yet it took me a long time to accept that. In our emergency department, we are now working more closely with our Chaplain Services and Charge Nurses to try to screen nurses for increased emotional stress after codes. We are working to implement “The Pause” after codes and offer more emotional support to our staff. “The Pause” is an intervention where there is a moment of silence after a patient’s expiration that allows staff to emotionally process the trauma of the code that they just experienced and take a moment torespect the human that the patient was. It is an EBP intervention that has been shown to improve healthcare staff mental health outcomes after codes. It is a slow process to get any change to happen in medicine but by using interventions like “The Pause”, it helps increase awareness of the emotional distress that our jobs can cause. Nursing has to become more aware of how our work affects us so that we can take care of ourselves. If we cannot take care of ourselves, we cannot take care of others. 6. If you could change one thing about nursing to address burnout, it would be: a change in perspective. If I could change on thing, it would be for healthcare and society to change their perspective of burnout as not being a sign of weakness, but a symptom of a non-supportive system. Healthcare MUST figure out a way to better support all professionals so that we can continue maintain a healthy work force that can deliver safe and efficient care to our patients. I continue to work to advocate for self-care, burnout awareness, and increased attention to nurse wellness. If we each do our part, we will see a much brighter future for everyone. 7. How long did it take you to feel "comfortable" in each new role you've taken on? Any advice to nurses who are experiencing the stress of starting something new? Change is always stressful, but remember that there is always growth in discomfort. If you are feeling comfortable in all things, you may not be growing. It has always taken me months to get truly comfortable in a new role. It just takes time! One needs time to learn the role, practice the role and learn the culture of the new position that you are in. This is never easy, but almost always worth the initial struggle. 8. What is the best part about helping nurses start their New Thing? Any advice for nurses who want to start their own business? Helping nurses with their new things is the ultimate thrill! You not only get to help with the new thing, but help individuals believe in themselves again. For any nurse wanting to start their own business, I say go for it!! But always do your research first and have a strategic plan. There are so many moving parts with businesses, and each situation will be unique depending on what is the person’s vision. I would highly recommend finding a mentor to help you through the process, to keep you organized and keep you motivated. It can be so hard to juggle your nurse job, your new business and your personal life. It gets stressful and sometimes you can get overwhelmed. Having someone in your corner to help cheerlead and guide you through the process can be an invaluable service. 9. You do a lot of traveling to some amazing places! What travel destinations coming up are you most excited for? Travel for me is a form of self-care and how I see myself grow the most. I always am trying to make new connections and gain new experiences to expand my world perspective, which I believe makes me a better nurse and human. This year, I am excited to be going on an ENA Cultural Exchange that will be taking us to Poland and Norway to meet with emergency nurses and observe their healthcare systems. I am crazy about seeing how other countries manage their healthcare systems and trying to see what aspects of their systems that I can bring back to the United States to continue to improve our practices. 10. How do you keep your spark for nursing alive? I continue to work on projects that I keep me passionate and motivated about nursing and beyond. I love teaching and working to improve pediatric care services for our littlest patients and their families in my emergency department. Kids and their parents have such a hard time when they come to the emergency department. I love helping to make their visits easier and less stressful. It makes my heart happy to see happy and healthy families. I am very involved with the Emergency Nurses Association (ENA). ENA has given me so many opportunities for personal and professional growth. It is another way that I can help nurses through networking, educational events and advocacy work. If anyone ever has questions about ENA, please reach out!! Lastly, I LOVE working with my New Thing Nurse clients to help them realize all of their personal and professional goals and dreams. There is nothing more powerful than helping others grow and achieve what they thought was impossible. I have helped nurses get jobs, nursing students ace papers, watched others receive academic awards, assisted nurse entrepreneurs grow their business and so much more!! New Thing Nurse has helped so many. I cannot wait to see who I can help succeed next! Anything I didn't ask that you would like to share? I love networking with nurses, nursing students and other healthcare leaders! Please reach out to connect at any time. New Thing Nurse is here to support our nursing community. We are stronger together. I can’t wait to meet all of you. P.S. I have an interview on Sarah's blog that went live today too! You can read it here.